It’s spring break for hte students at the Space Academy, so Jeff Wells and his robot, Norby, are ready to have some fun! They’re all set to visit the planet Izz, where they hope to see the princess and her robot, Pera. But before they even land, Norby receives a telepathis signal from Pera. He can’t make out the whole message—but he can hear her cry for help loud and clear. Jeff and Norby know that the ingrate Ing was banished years ago from the Federation and is now court jester on Izz. But could Ing be threatening Pera with his evil bag of tricks? NO ONE KNOWS ROBOTS LIKE THE ASIMOVS! I can remember virtually nothing of this, the last Norby book on which the Good Doctor worked. That’s probably a bad sign. 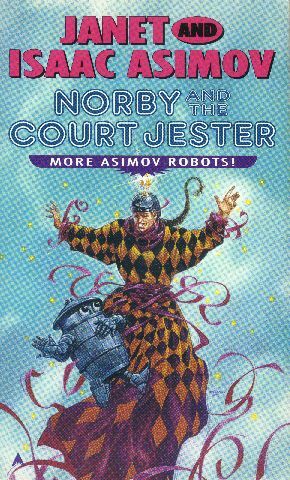 I do remember that the court jester in question is none other than Ing the Ingrate, sort of fitting since he’s the villain of the first Norby book, Norby, the Mixed-Up Robot. Other than that, the book is clearly something to live without.